Hold up, sporting enthusiasts! Before you go any further, check out our first VIDEO REVIEW below! 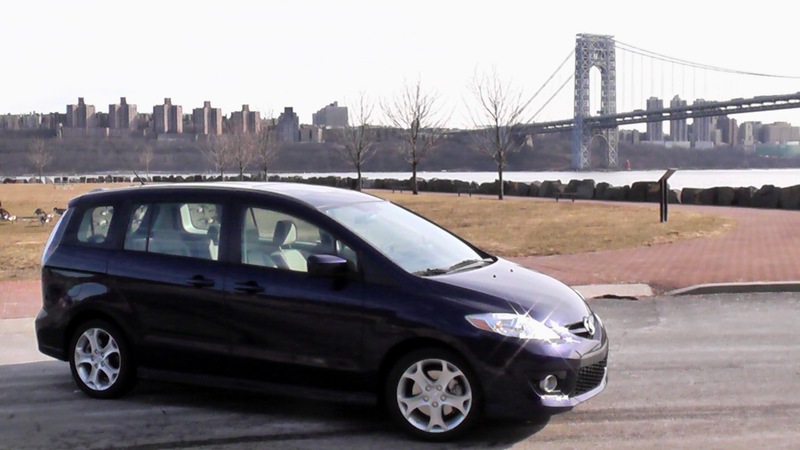 The Good: More playful than “minivan” would imply; sleek styling; surprisingly affordable. The Bad: Space rather limited; sliding-door stigma remains. The Ruling: The minivan for people who hate minivans. The very word is enough to make most men shudder. It conjures up images of middle-aged suburban fathers losing hair and gaining weight, forced to shuttle their ungrateful little bastards from one yuppie-child activity to the next. (“They have Pilates for first-graders now?”) The minivan screams sexless, joyless, suburban purgatory, a rolling reminder that the best days of your life will forever be in that rear view mirror. 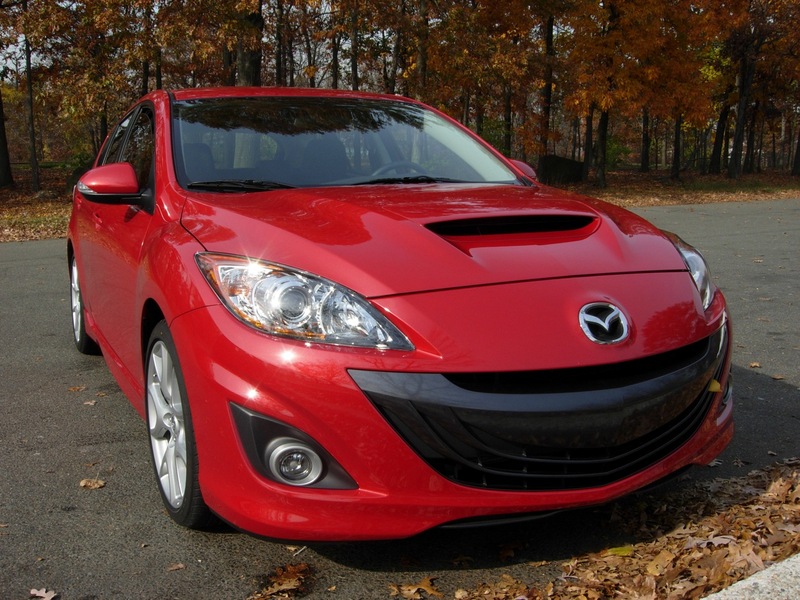 The Mazda5, though, begs to differ. Just a glance at it brings hope to the downtrodden American men sought after by every company to broadcast a commercial during an NFL game. Far from the amorphous bulging shape common to traditional minivans and beer guts, the 5 cuts a svelte hole through the atmosphere, knifelike creases evading the wind while catching the eye. 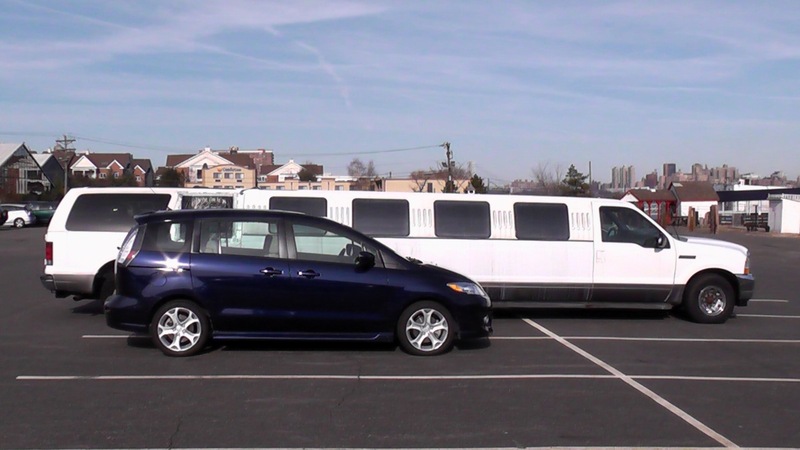 This minivan works out – a cardio-heavy regimen, admittedly, but park it next to a more conventional van and it looks downright stunning. 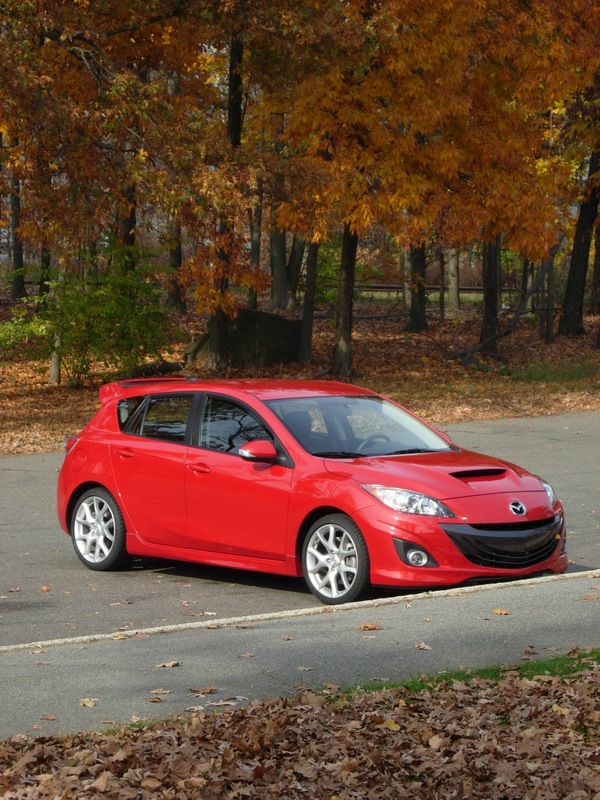 In fact, it’s almost a stretch to call the Mazda5 a van at all, at least by American standards. Lower, lighter and smaller in every way than pretty much any minivan in the states, the only thing truly tying it to its name mates are the twin sliding doors mounted between the B- and C-pillars. 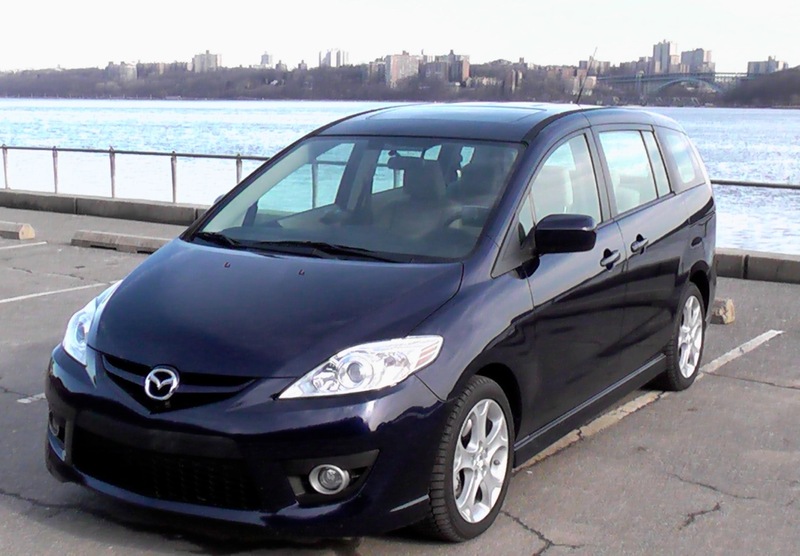 In size and stance, the Mazda5 has more in common with a good old-fashioned station wagon than the hulking machines with the chutzpah to call themselves “minivans.” If anything, the Mazda5 puts the “mini” back in minivan. Not surprisingly, though, the small engine has to work pretty hard to motivate the 5 with any verve, so fuel economy can suffer. Follow the speed limits and act like your driver’s ed teacher is in the car, the EPA estimated mileage of 21 city/27 highway with the automatic should be pretty attainable; drive like the average automotive journalist (we’re still bitter that our driver’s ed teacher thought they knew more than us), and you’ll average about 23 mpg. 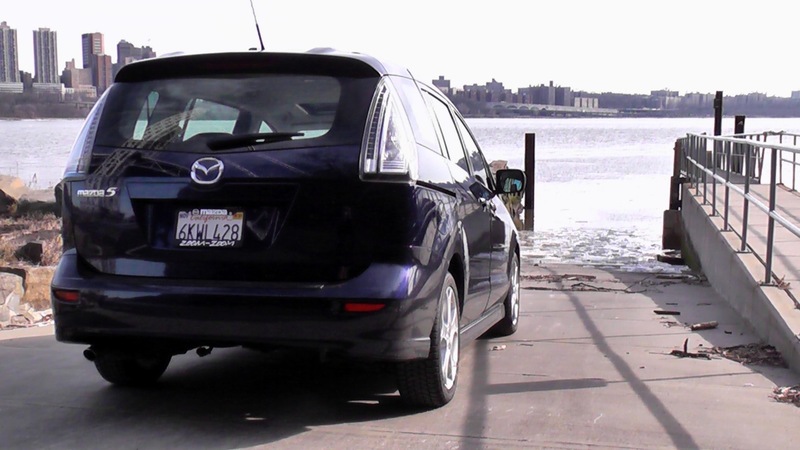 Fun as it may be to drive, the true test of a minivan is how well it moves people, and it’s here the Mazda finds its litheness coming back to bite it in the surprisingly small keister. The length and width that make the Caravans and Siennas of the world so much less fun to drive gives those bigger vans far more places to cram adults, kids, coworkers, hitchhikers, aliens – whatever form of carbon-based life form floats your boat. The 5, for its part, imparts various feelings of constriction on its occupants depending on where they sit. Driver and front passenger will probably go with “cozy;” middle-row occupants may choose “tight;” those exiled to the back row would probably say “claustrophobic” if their knees weren’t already jammed into their mouths. 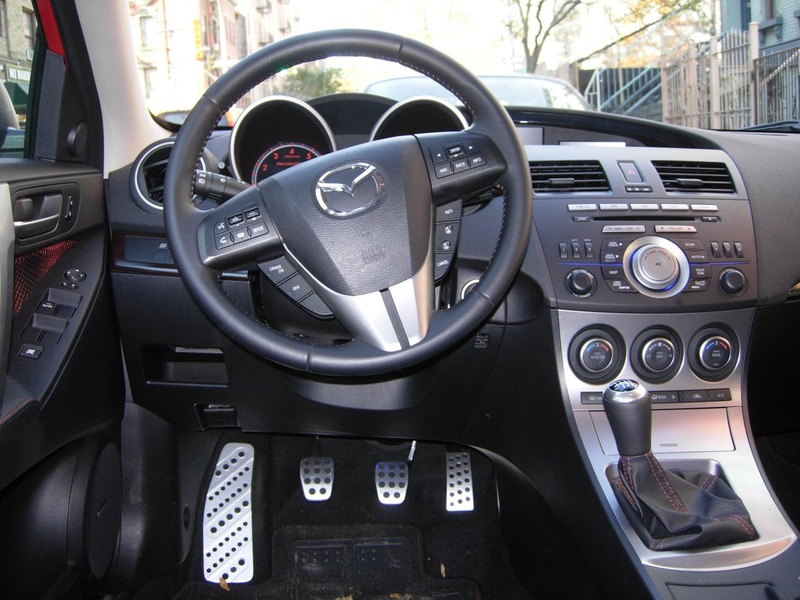 The 5 doesn’t shy away from packing on features, either; my mid-level Touring model packed on automatic climate control, a six-disc CD changer, satellite radio, a moonroof and keyless entry for a little more than $22,000. Even the fully loaded Grand Touring model (which adds on leather seats, xenon headlamps, a nav system and Bluetooth) goes for a bit less than $24,000 – less than most midsized sedans these days offering those same features, and certainly lower than similarly equipped members of the minivan clan. The truly frugal can take home a base 5 for $18,745 or so – but they’ll have to know how to row their own gearbox for that price. 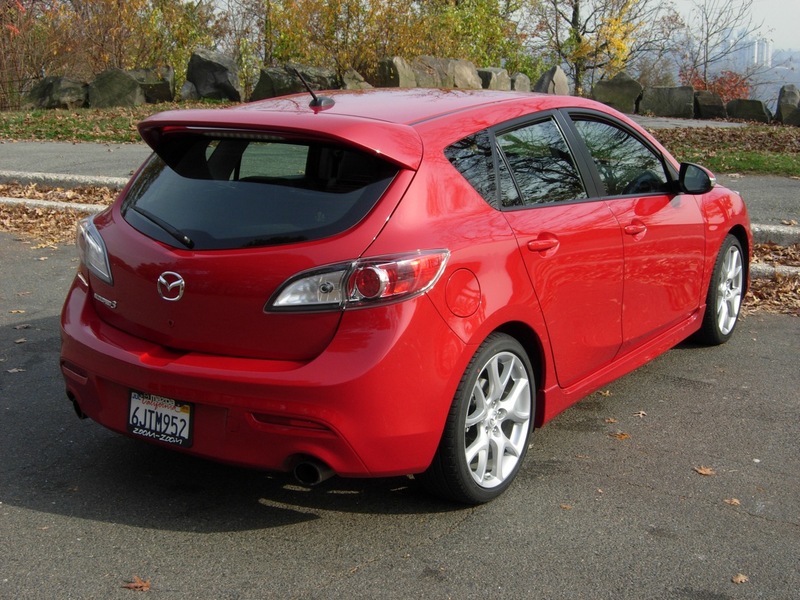 The “minivan” word doesn’t really apply to the Mazda5, in all honesty. In reality, the 5 is a station wagon that just happens to have sliding doors. While it certainly gives away quite a bit in terms of space to bigger, boxier vans, for the average nuclear family, the 5 offers an ideal compromise. It has enough room for two adults, their 2.5 kids and their accompanying soccer gear; it’s enough fun to keep the front left seat from feeling purgatorial; and best of all, neither the monthly bank account nor the fuel bill will devastate the familial bank account. Much like the Simpsons themselves, the 5 is far from perfect – but by God, you can’t help but love it.